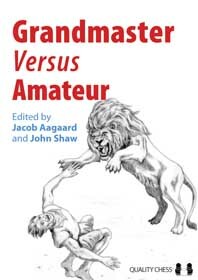 "Quality Chess has launched a new book titled Grandmaster versus Amateur, which interestingly enough uses the same successful concept as two earlier publications (Experts on The Sicilian and Experts on the Anti-Sicilian): the book is a collection of essays by various grandmasters. Obviously, this time the grandmasters are no evident experts on a specific variation, but sure enough entertaining writers with ample experience on the subject: grandmaster against amateur. All in all Grandmaster versus Amateur does not have Euwe’s methodical approach in Chess Master versus Chess Amateur, a title which was brought to the editors attention when the project was already up and running. Yet the book has become a highly entertaining compilation, with lots of interesting stuff to learn and to think about, suited for all kinds of chess players." Readers will enjoy the lighthearted approach, candor, and self-effacing humor that Danish-born grandmaster and co-editor Jacob Aagaard brings to the book's first chapter, titled Danes Eat Fish for Breakfast. Of all the essays in this compendium of grandmasters, Shaw's seems the most heart-felt and poignant... This is the confessional side of chess, and his struggles may feel more like our own. This is a jocular and lively collection, one that strives to address the reader's own capabilities, while not taking its own approach too seriously... Through its rollicking pages, Grandmaster Versus Amateur shows us that even though the road to the top is a minefield, struggle is noble, and playing itself can be fun where you find it.